This post is sponsored by Foster Farms®. All opinions and views are my own. Fall is finally here! As we say goodbye to the warm, sultry days of summer…we welcome in the crisp autumn leaves of fall and the pleasures of simple, delicious home cooked meals. 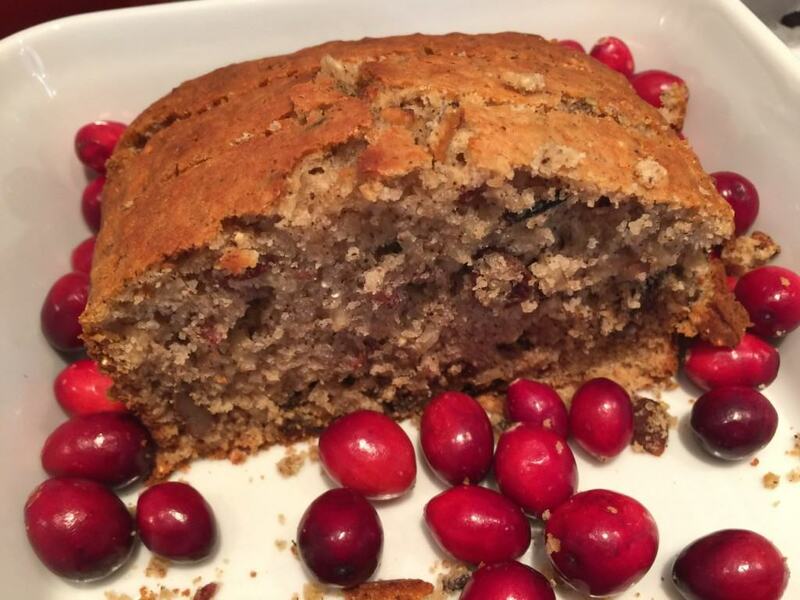 When I was growing up, my stepmother made all sorts of comfort food for the family. She was famous for her homemade chicken noodle soup, piping hot pot pies, creamy mashed potatoes and warm apple strudel. Every evening was like a feast around the table! She always had something brewing in the kitchen that I looked forward to coming home to. So now that I’m a mom, I also like to make comfort food for my family. But with a twist! I prefer our meals to be as fresh and healthy as possible. Therefore, I like to buy fresh produce from the farmer’s market and locally grown meat from the grocery store. 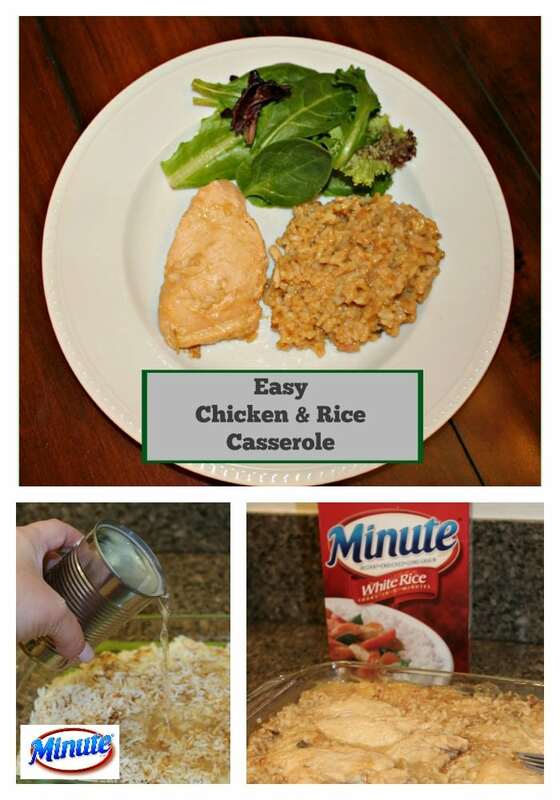 Over the last week, I have been on an “easy meal kick”! With the holidays right around the corner, I have had no time for fancy recipes that require endless amounts of slicing and dicing. Just give me the can and I would be happy to open it! Ding! Dinner served. 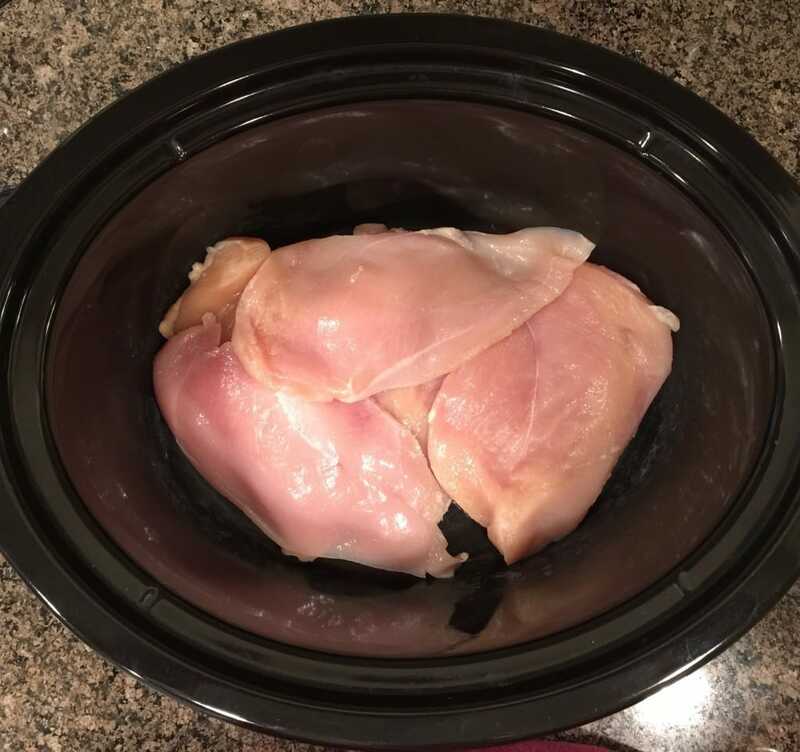 That’s why I like to make this South Western Chicken Crock Pot Recipe whenever I am in a hurry and don’t have time to meal plan for the week. Typically, I always have most of the ingredients in the house. But here’s a tip! When you are out grocery shopping, stock up on the needed supplies, and you will never be without an easy crock pot meal again. 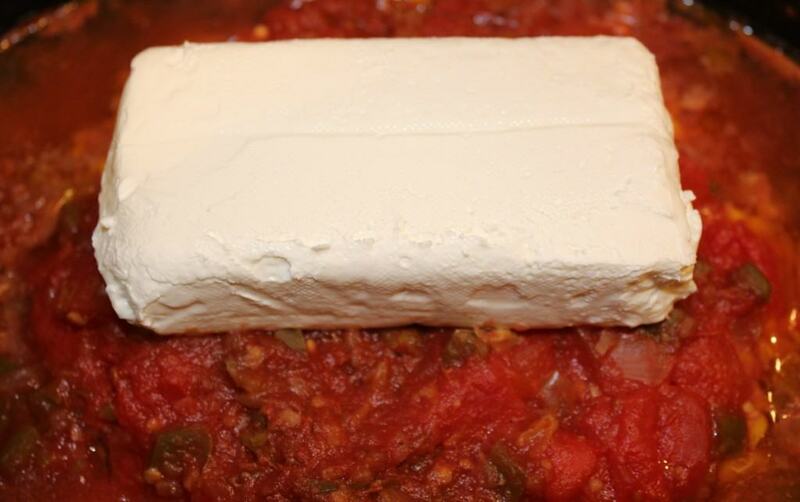 Even the creme cheese in this recipe can be frozen. So on the morning of, just add everything to the crock pot, and out the door you go! No thinking required! First, spray the inside of the crock pot with PAM. This will prevent the frozen chicken from sticking to the ceramic dish. 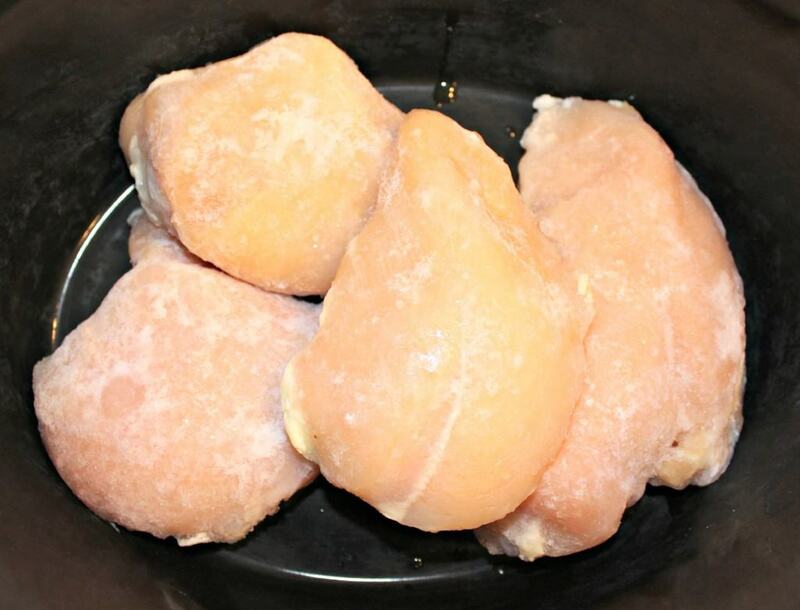 Next add the frozen skinless chicken breasts to the bottom of the crock pot. 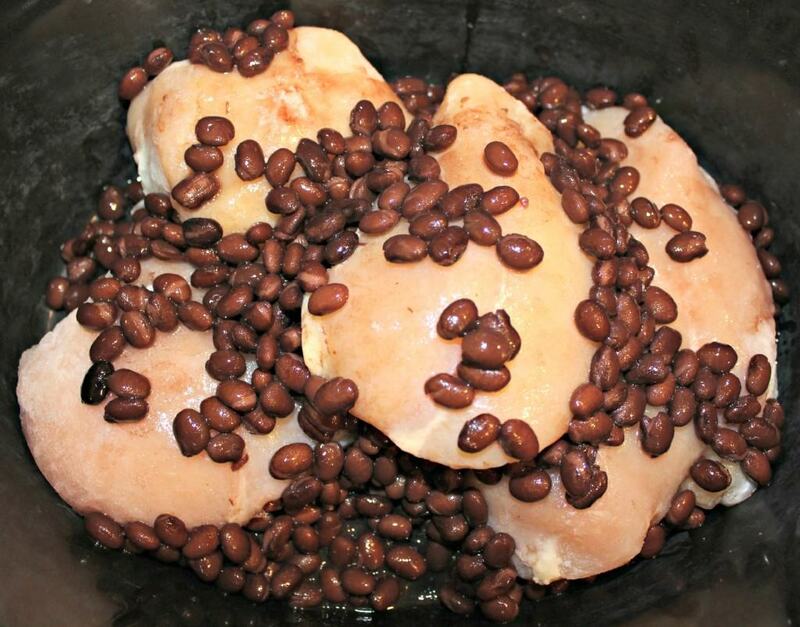 Drain the can of black beans and add them on top of the chicken. 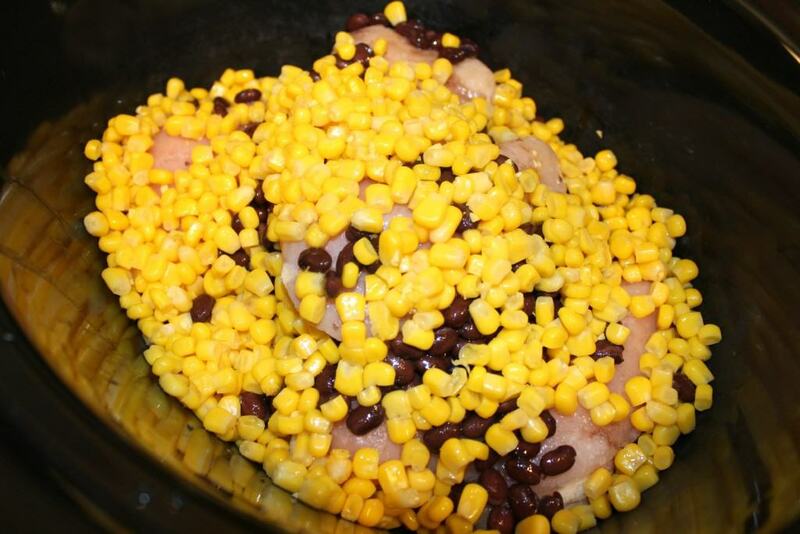 Drain the can of yellow corn and add it on top of the beans. Open the can of Hunt’s Diced Tomatoes and pour it in. 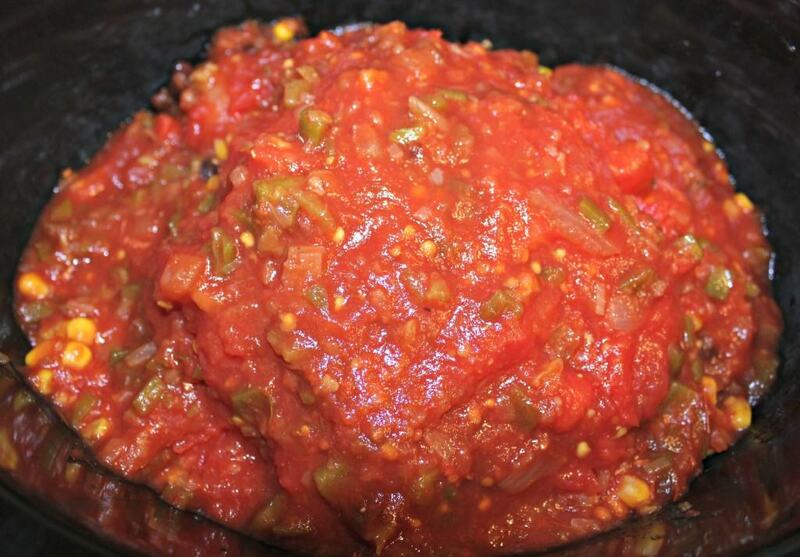 Last add a jar of mild salsa to the crock pot. 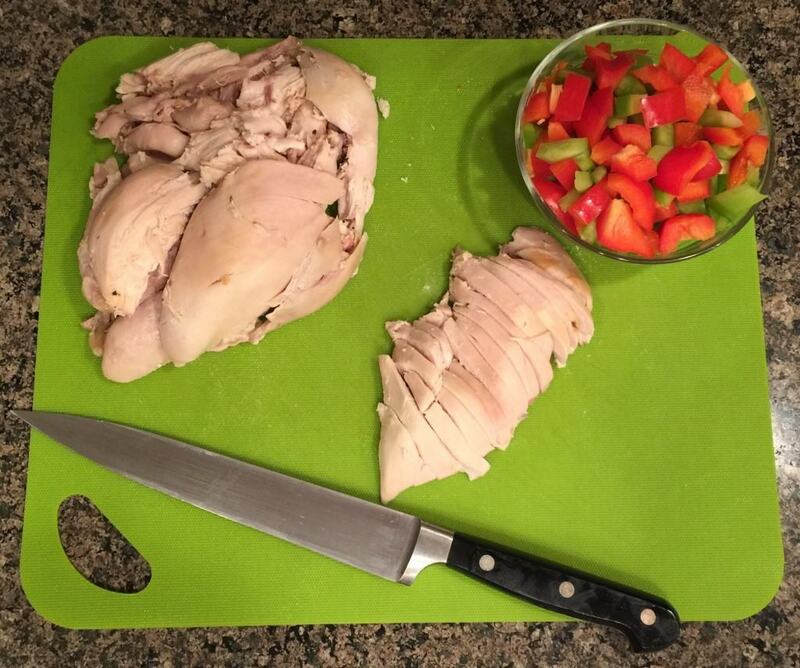 Cook the South Western Chicken on low for 8 hours or on high for 6 hours. 10 minutes before the dish is done add a block of creme cheese on top to melt. 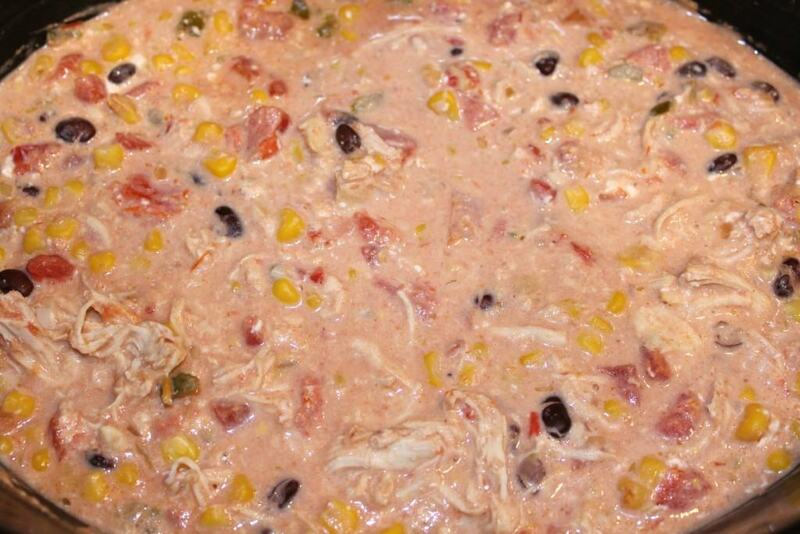 Finally, cut up the chicken in the crock pot with a fork and knife and stir until fully mixed. 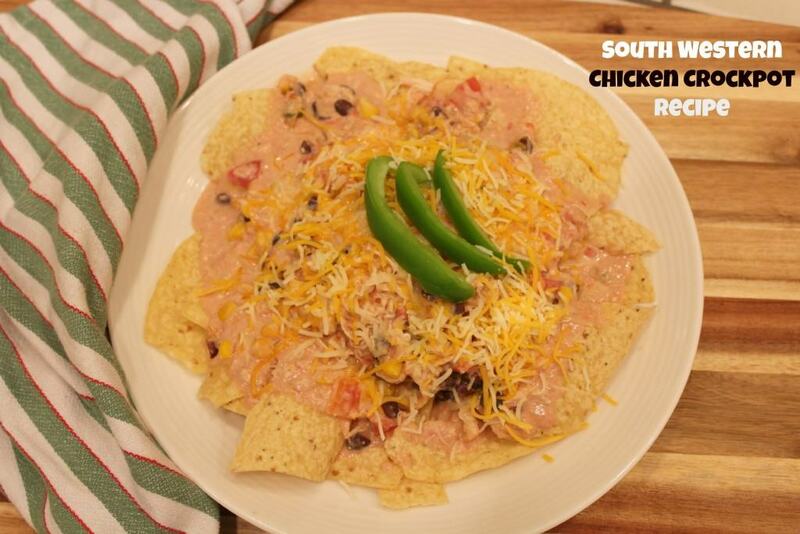 This South Western Chicken is best served over tortilla chips or as a filling for tacos and burritos. 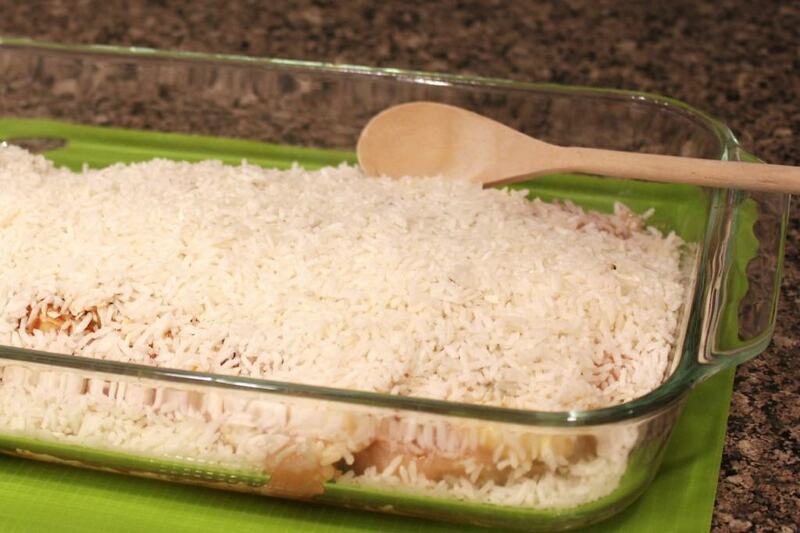 I also like to add a little shredded cheese on top prior to serving. 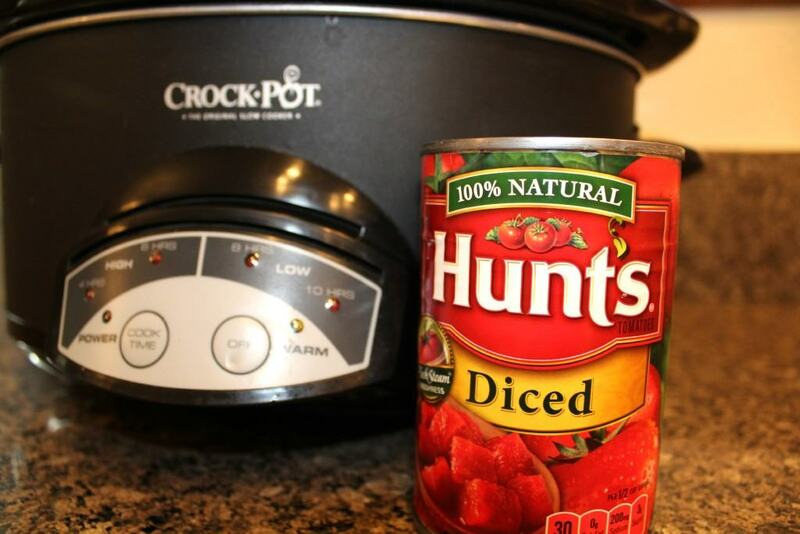 I prefer to use Hunt’s Diced Tomatoes for dinner and cold weather meals, because they help save time with easy, stress free recipe creations during the holidays. 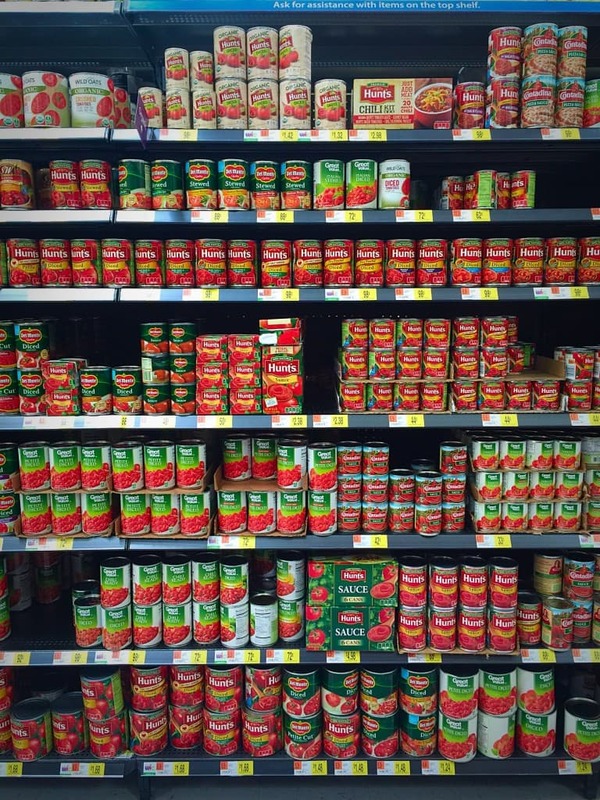 I just picked up a can in the canned food aisle while doing my regular shopping at Walmart. 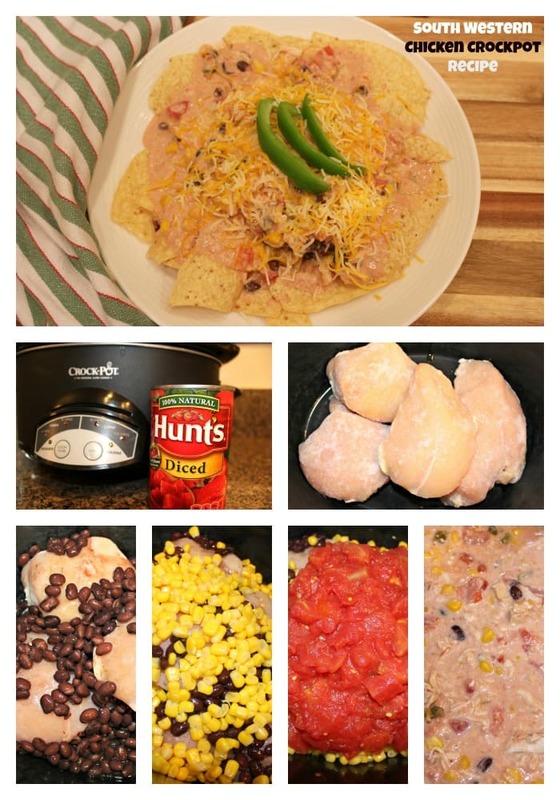 Pin the South Western Chicken Crock Pot Recipe for future reference! 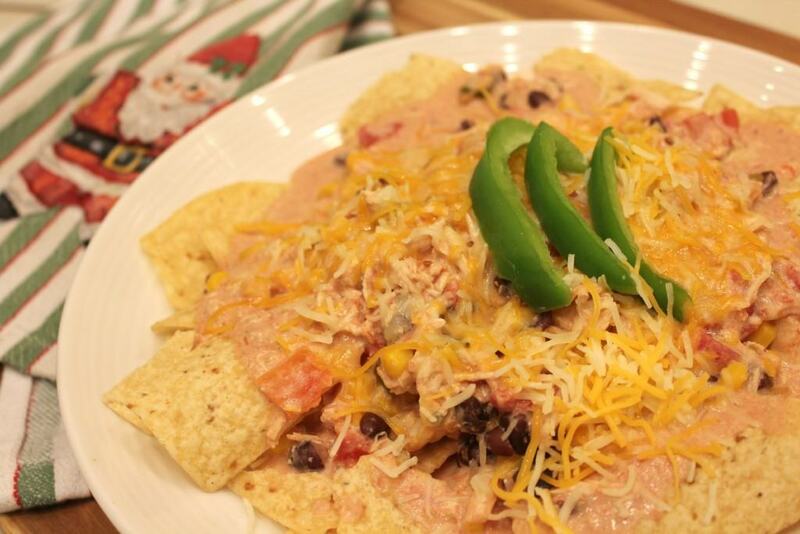 What type of easy meals do you like to make in December? Please share with us in the comment section. In the meantime, for some more inspiration visit Yes You CAN Holiday! This is a sponsored post. 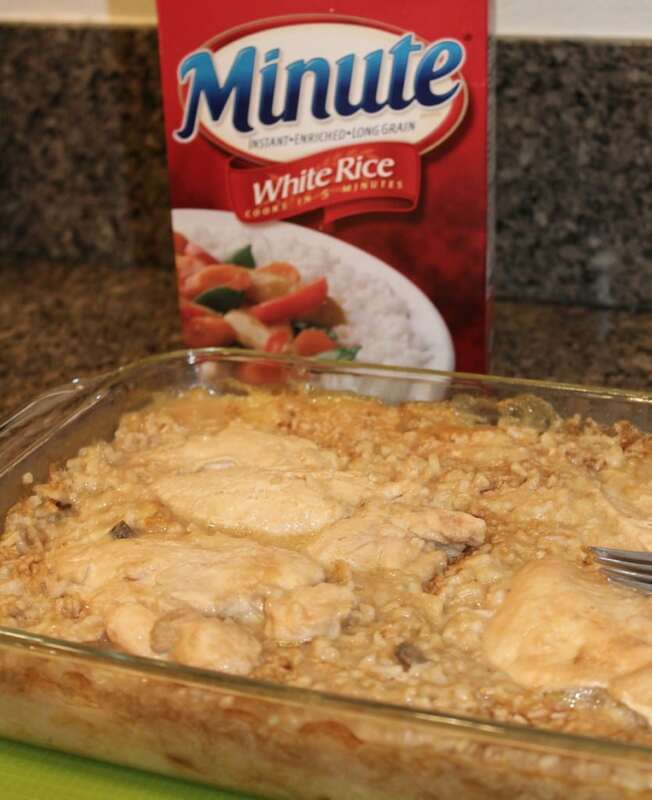 Get ready for the holidays with Minute® Rice! You know it’s coming! Only two short weeks away and Christmas will be here! 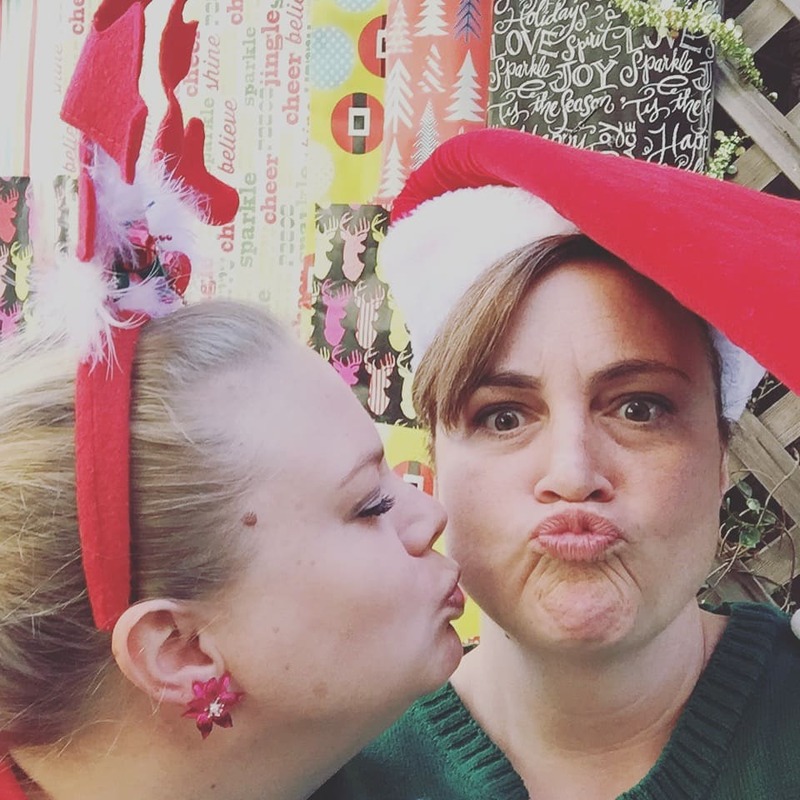 I don’t know about you, but I always tend to rush last minute just to get everything done – party preparation, wrapping Christmas presents, decorating the Christmas tree, sending out holiday cards and so much more. Sometimes it just feels overwhelming! But this year I am determined to shift down a gear and plan ahead. 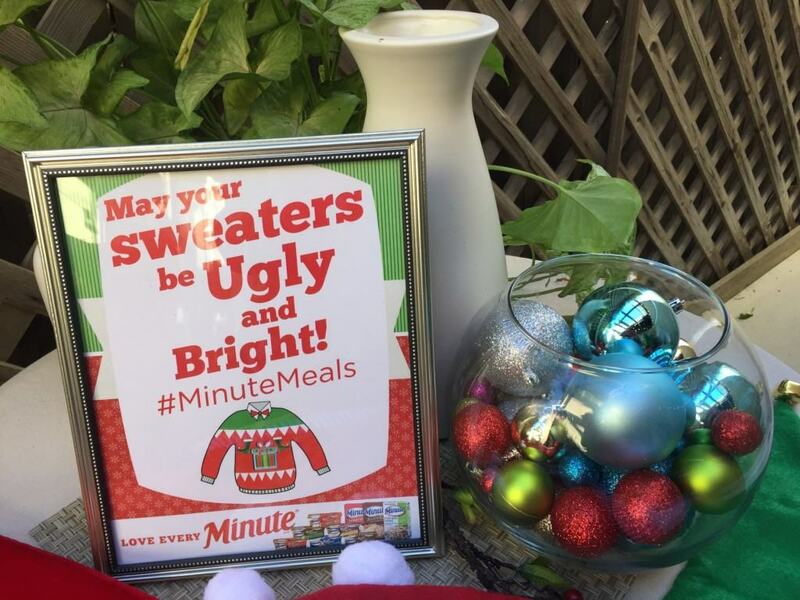 So last week to get some inspiration, I went to a holiday party sponsored by Minute® Rice. 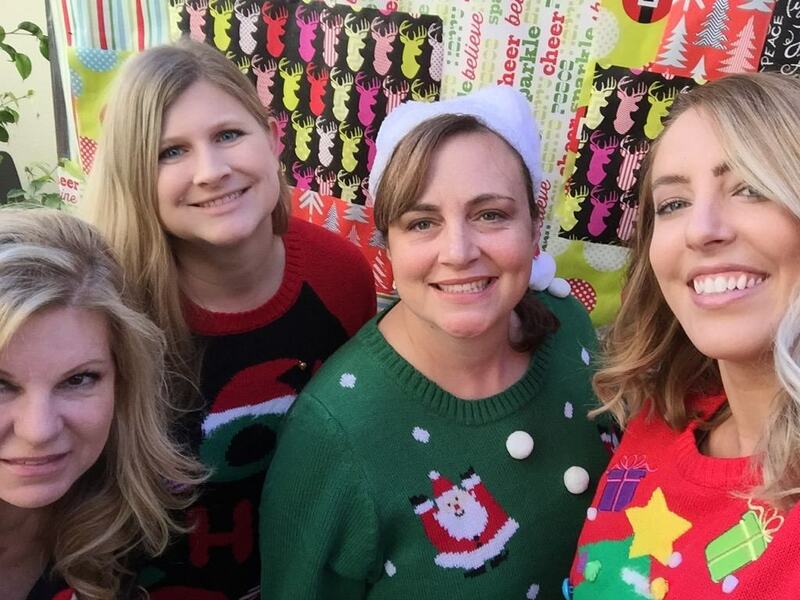 Well, to be honest, it was more of an Ugly Sweater Party! 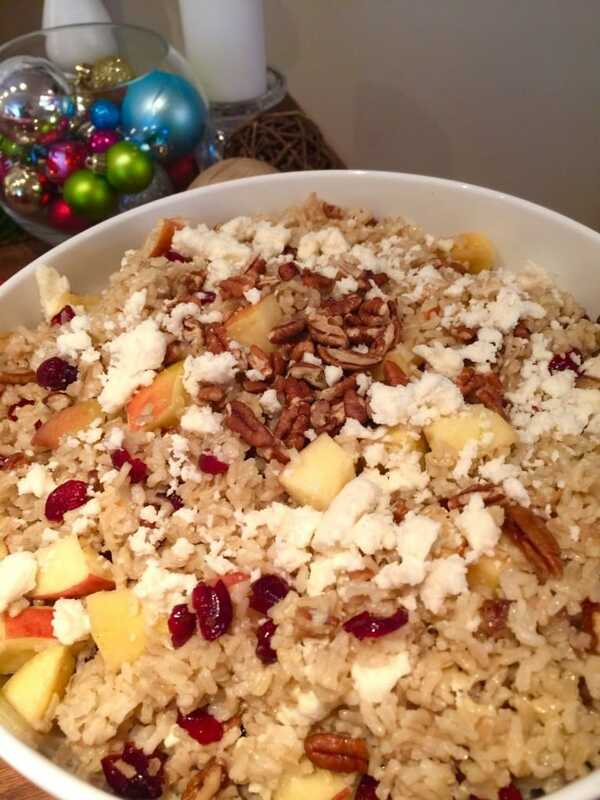 While in attendance, I learned all sorts of new and creative ways to cook with Minute® Rice and prepare a variety of tasty dishes for the holidays. 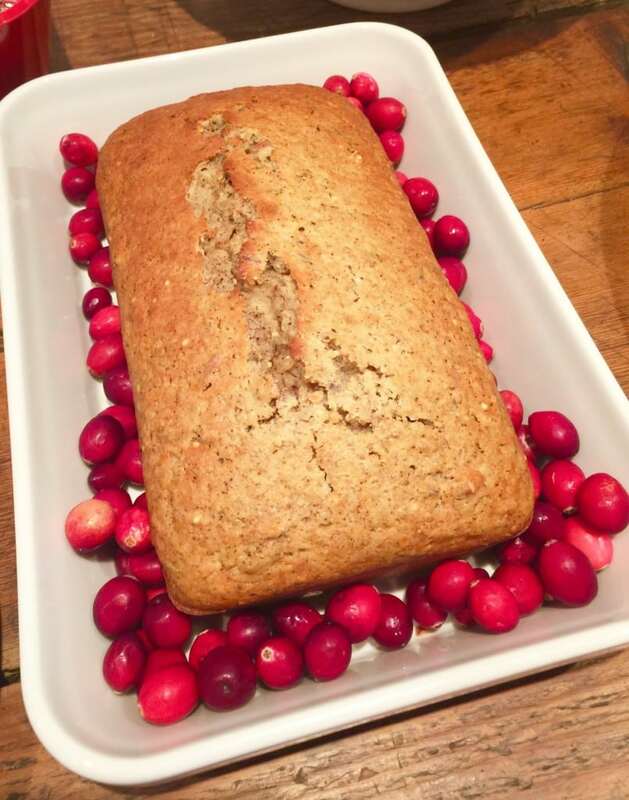 Who knew you could add Minute® Rice to banana bread to make it a little crunchy! No party is complete without dessert, right? 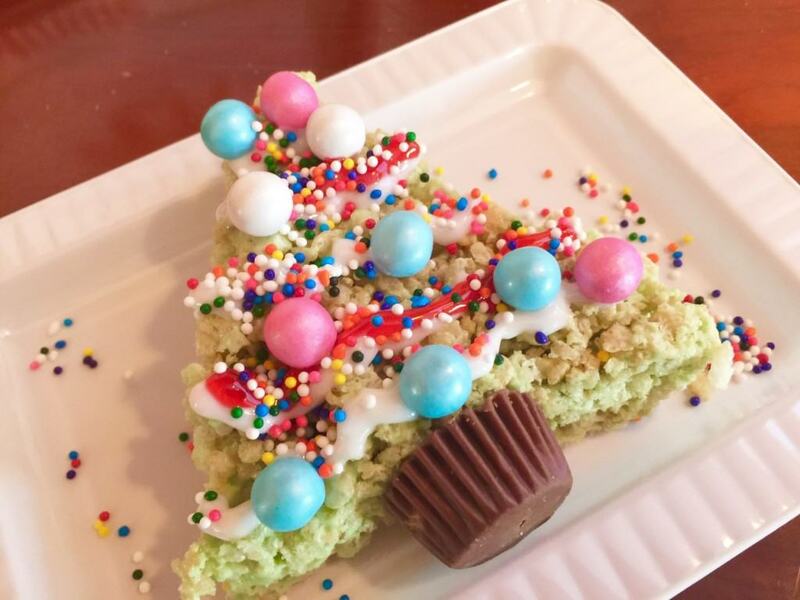 So our Ugly Sweater Crew made their very own Rice Krispy Treats. Yummy! 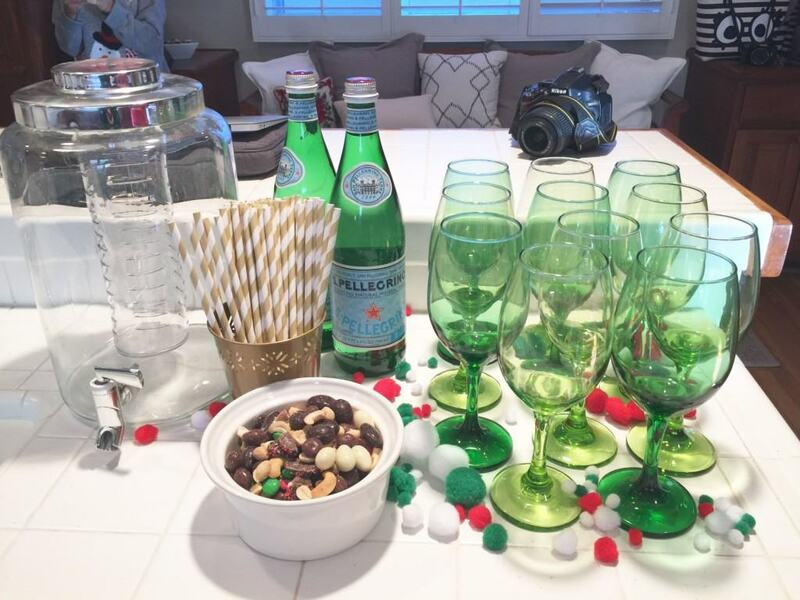 Once I got home from the party, I was super motivated and got started on my holiday preparations! 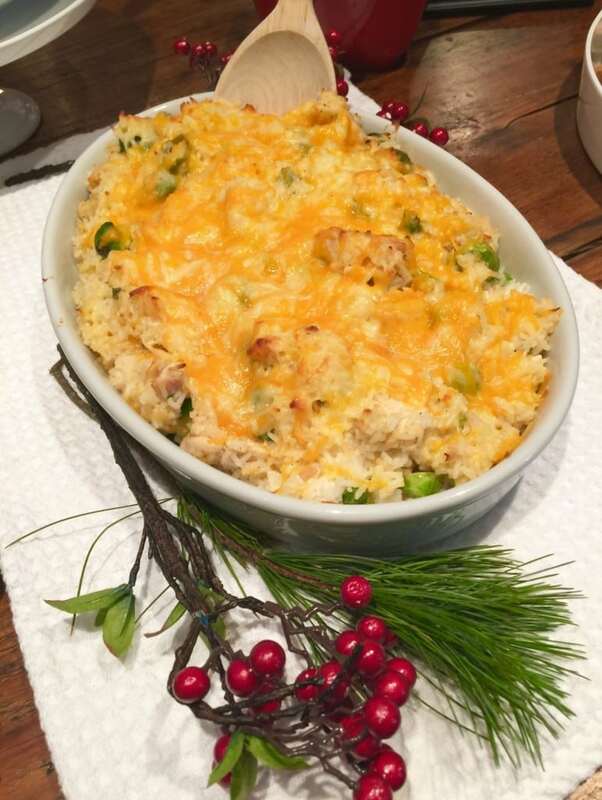 I wrapped a few presents and put them under the tree, ordered my holiday cards and cooked up a patch of my mom’s world famous Chicken and Rice Casserole for dinner. 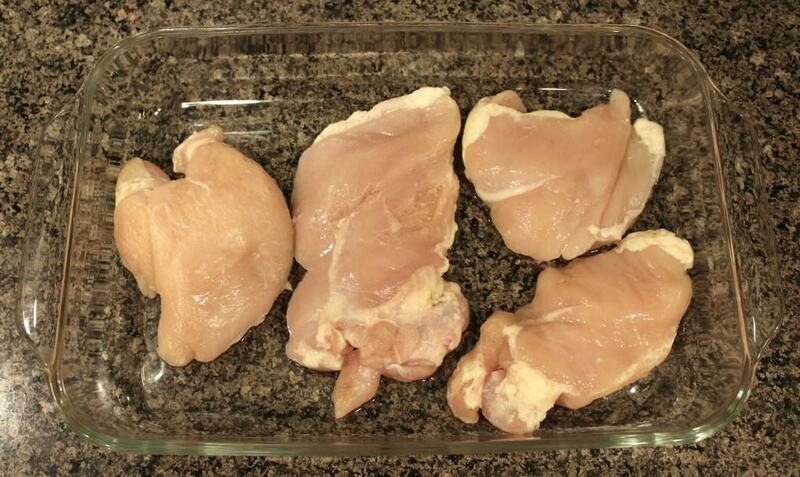 Place 4 skinless chicken breasts in a 9×13-inch rectangular size pan. 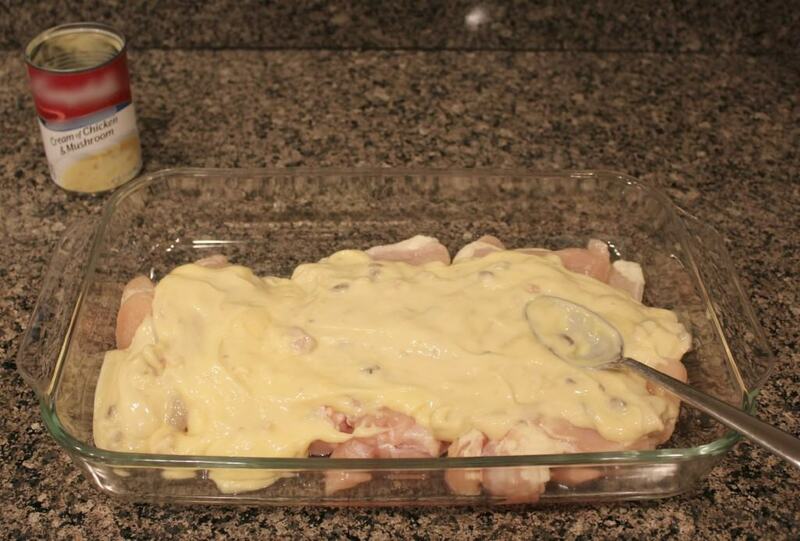 Add 1 can of Cream of Chicken and 1 can of Cream of Chicken & Mushroom on top of the chicken breasts. Add 2 dried onion season packets on top of the chicken. 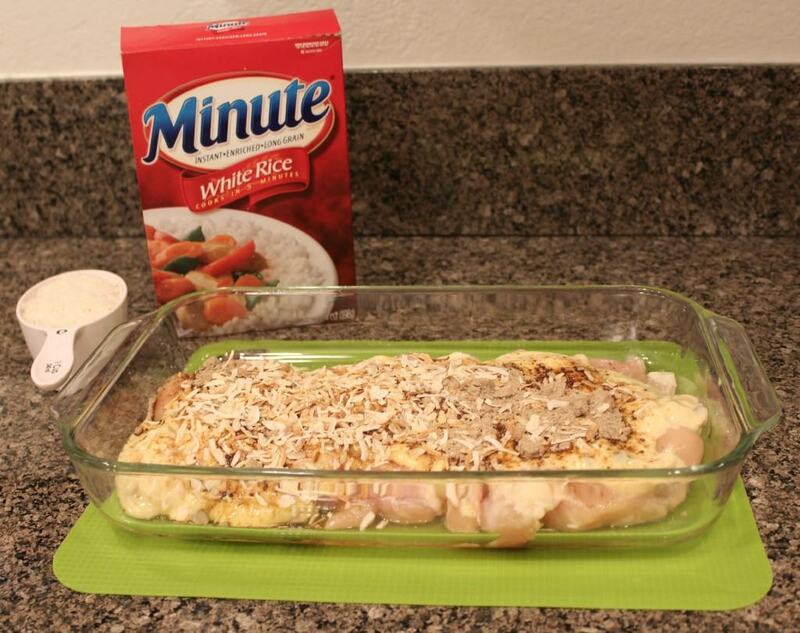 Add 2 cups of Minute® Rice White Rice on top. 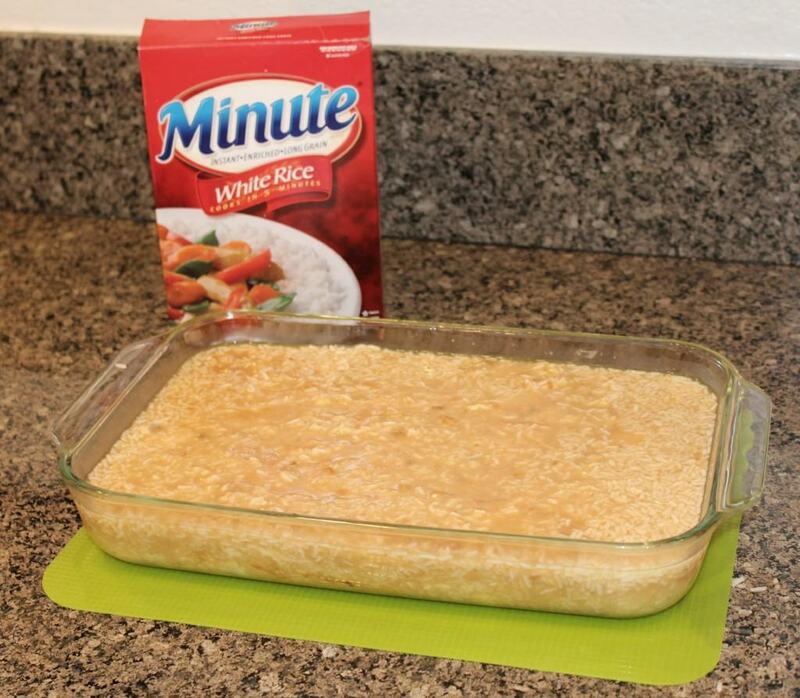 I enjoy cooking with Minute® White Rice, because it a great-tasting, fluffy white rice ready in only 5 minutes. You can’t get any quicker than that! 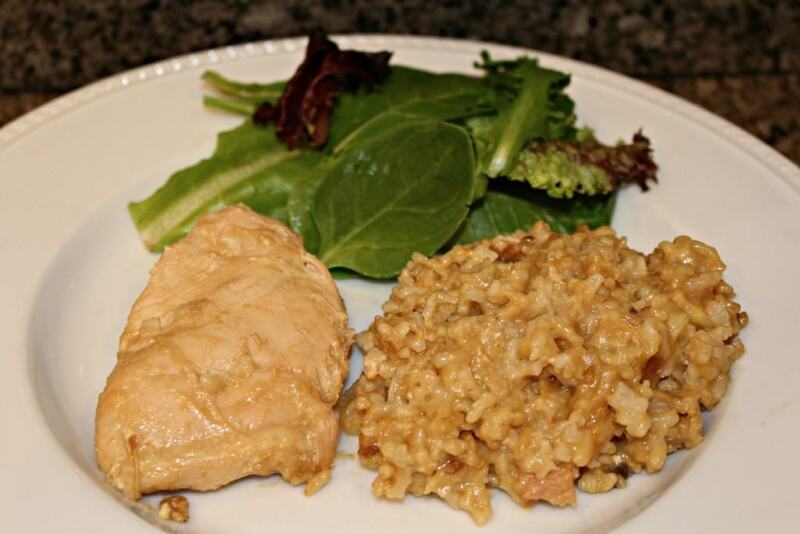 But if you like a more nutty, rich flavor of brown rice, you can use Minute® Rice Brown Rice instead. 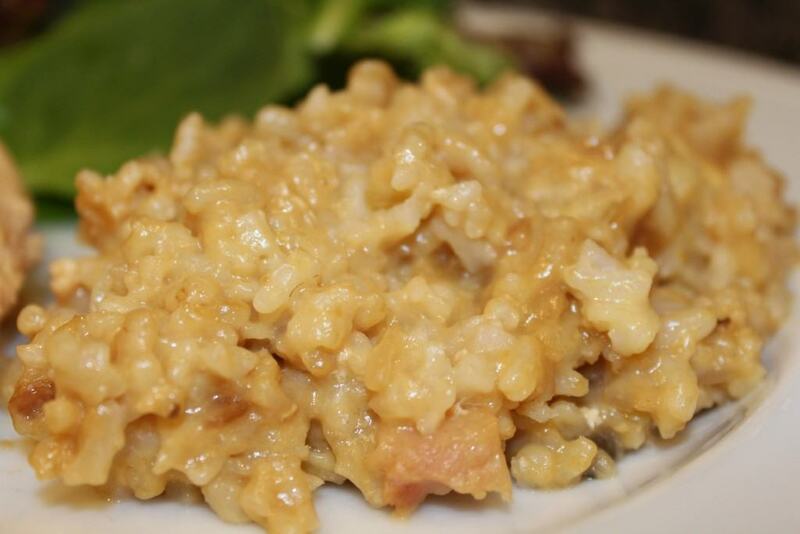 Minute® Rice Brown Rice is a delicious, nutritious option that is similar in nutritional value to regular long cooking brown rice. Plus it is gluten free! 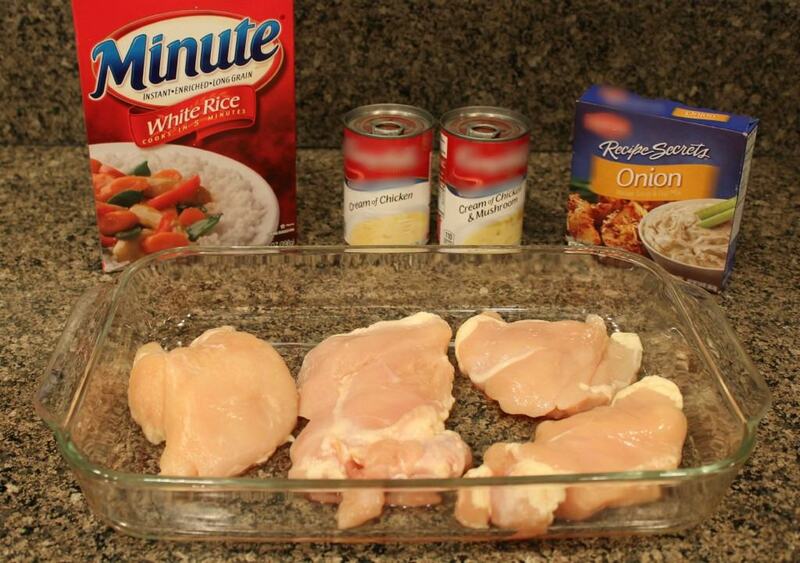 Add 2 cans of water to the Chicken and Rice Casserole and stir. 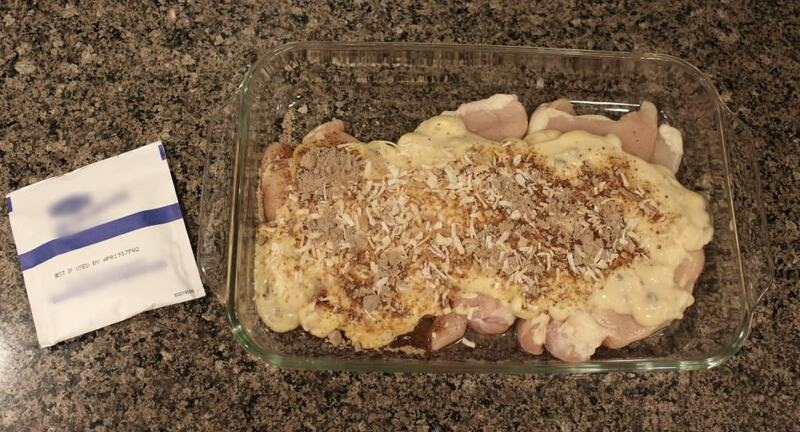 Cook the Chicken and Rice Casserole at 350 degrees in the oven for 1.5 hours. After 1 hour of cooking, turn the chicken over and place it on top of the rice. 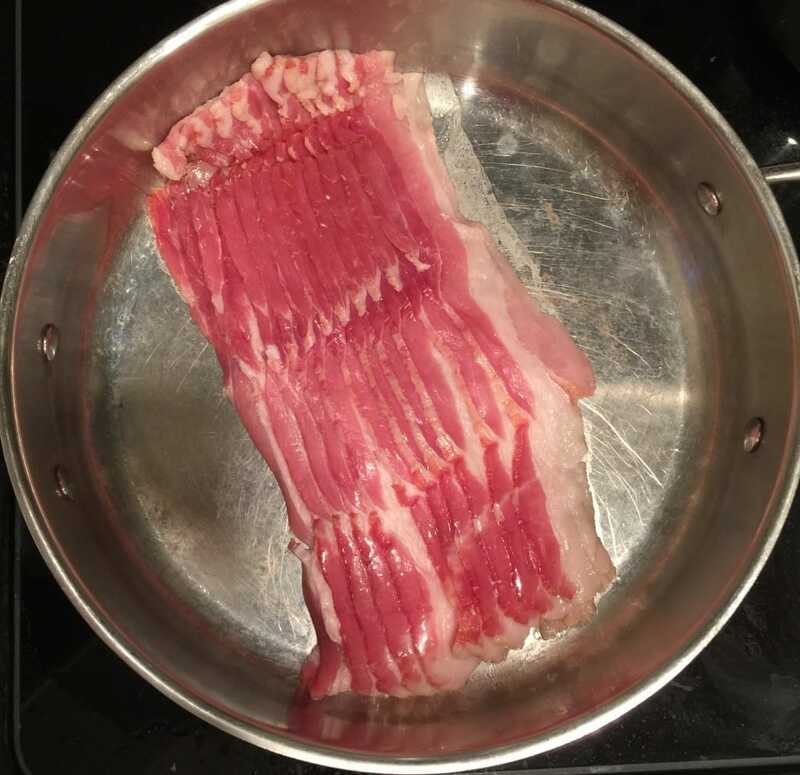 Cook for another 30 minutes. 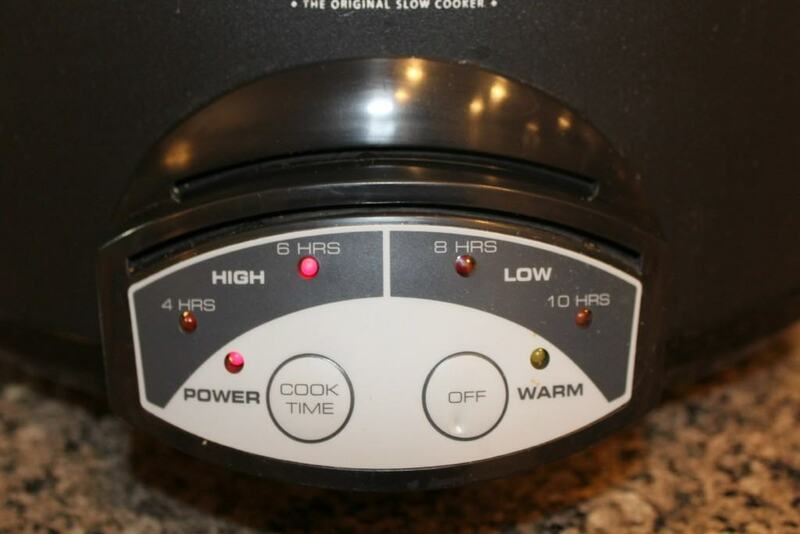 Watch closely to make sure the rice does not brown. 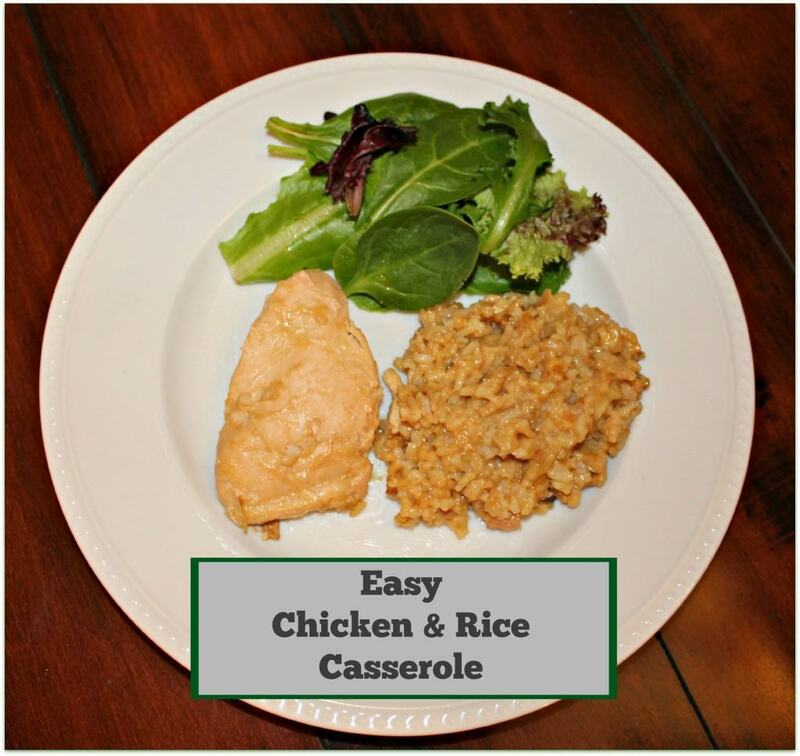 Serve the Chicken and Rice Casserole with a side salad and enjoy! 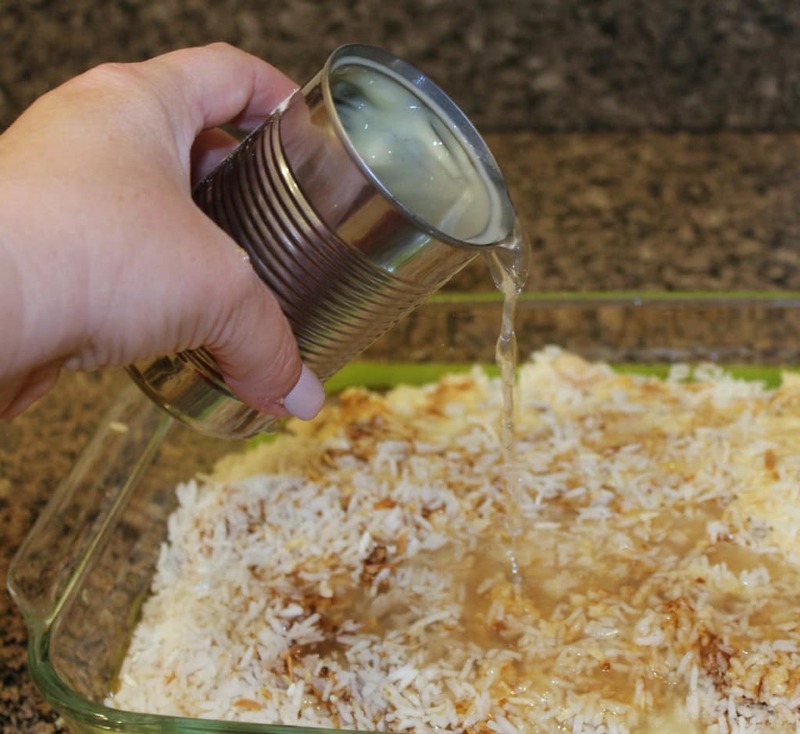 Don’t forget to pin the recipe for future reference! 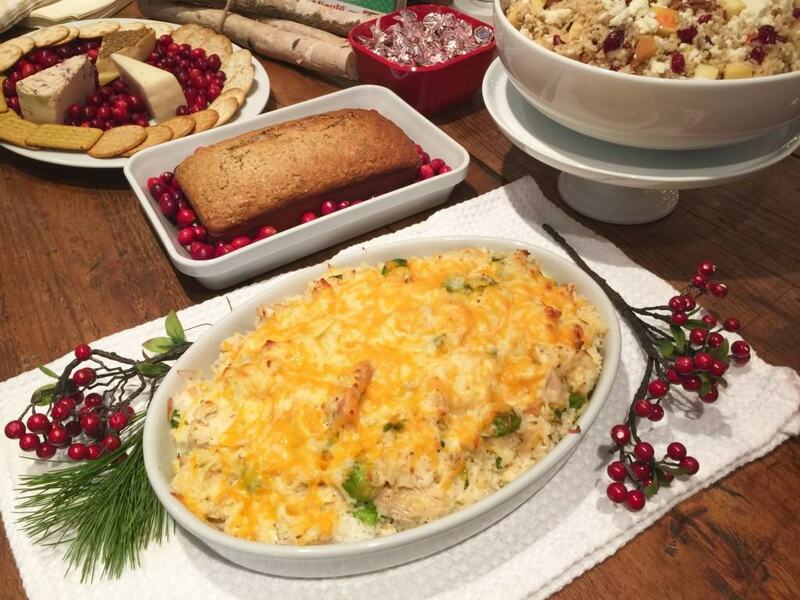 Now that you are inspired to cook an easy holiday meal, visit Minute® Rice for over 400 recipe ideas, great for any day of the week or join the Minute® Rice Recipe® Club! Summer time is here! This post is sponsored by Foster Farms®, but all opinions are 100% my own. 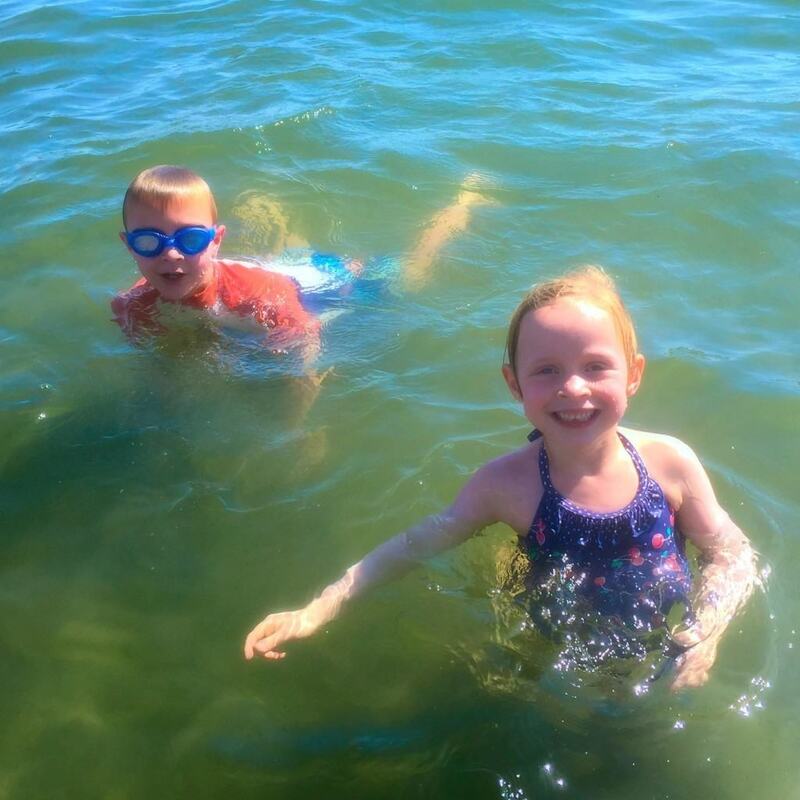 Last week I took Field Trip Boy and Field Trip Girl to our local lake for the first time this summer. They have been asking for months to go swimming and there was no better time than the present! 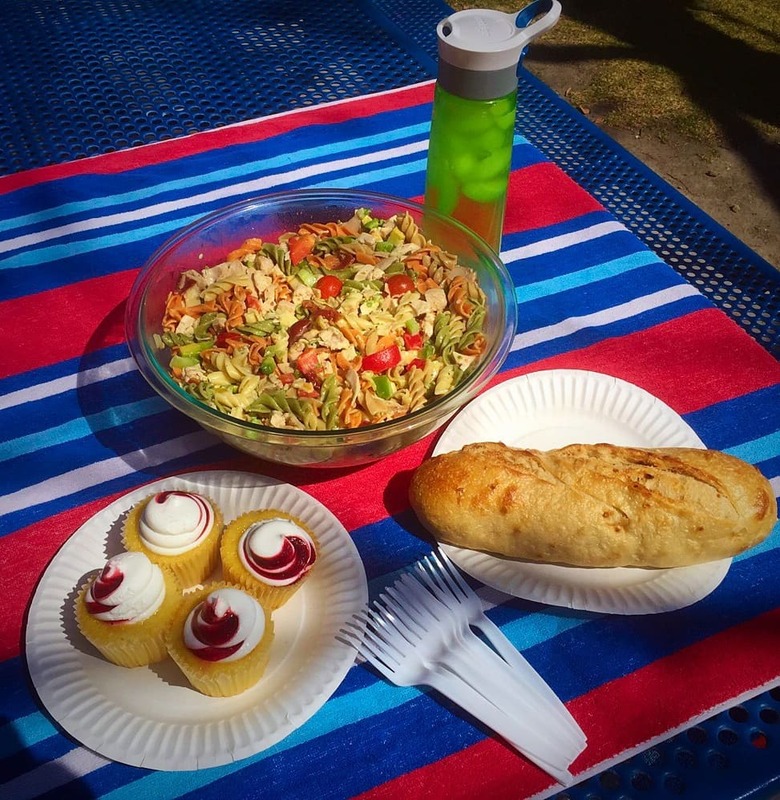 To celebrate the occasion, I packed a picnic lunch and made one of my favorite all-time favorite dishes, Chicken Pasta Salad. 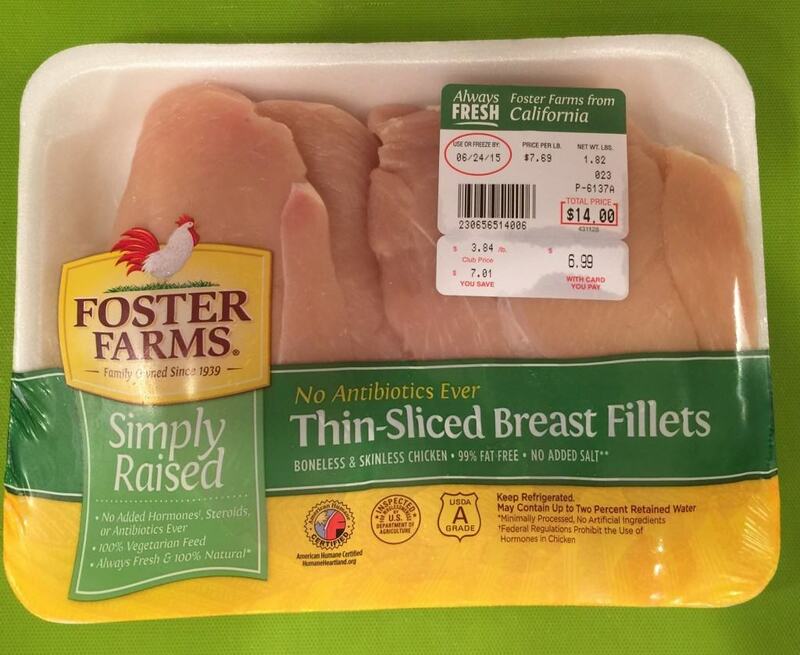 For my Chicken Pasta Salad, I prefer to use Foster Farms® Simply Raised chicken. As a California native, it nice to know that Foster Farms® chickens are locally grown on the West Coast and American Humane Certified. 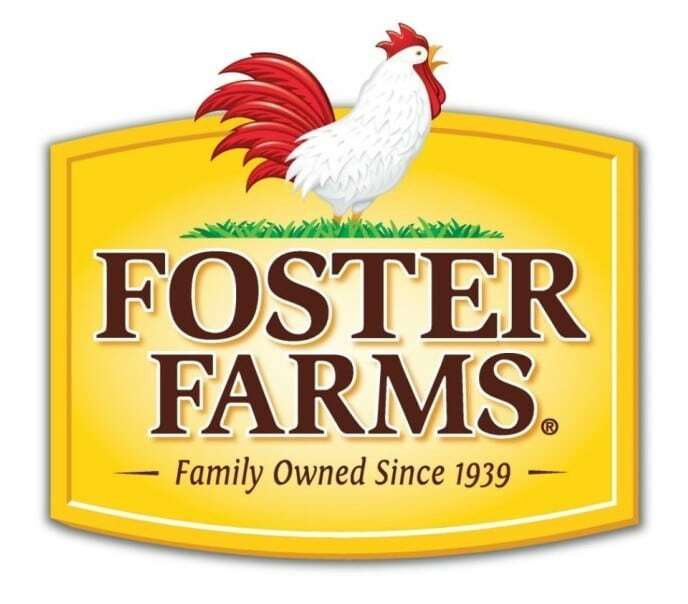 Plus Foster Farms® have been family-owned and operated since 1939 and their chicken is widely available throughout California at select supermarkets and Costco. 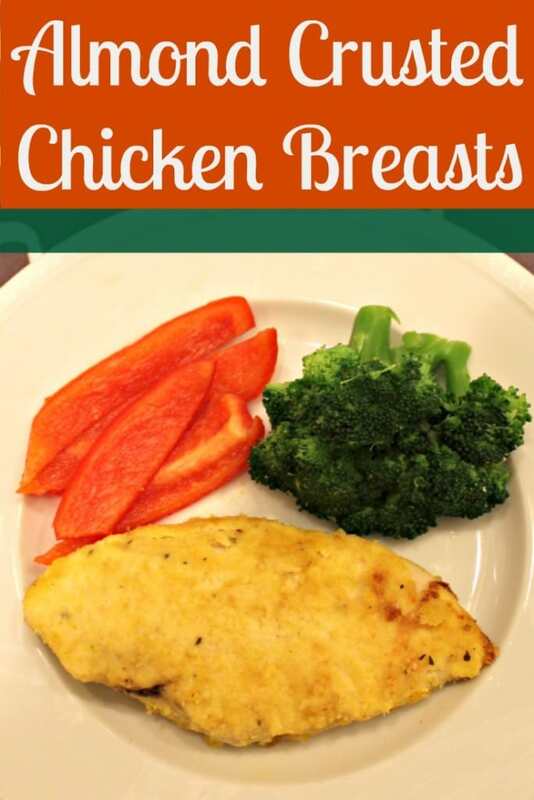 As a mom, I appreciate the fact that Foster Farms® Simply Raised chicken uses no antibiotics, 100 percent vegetarian feed, 100 percent natural (minimally processed, no additives or preservatives, steroids or hormones) and produced with no added sodium. 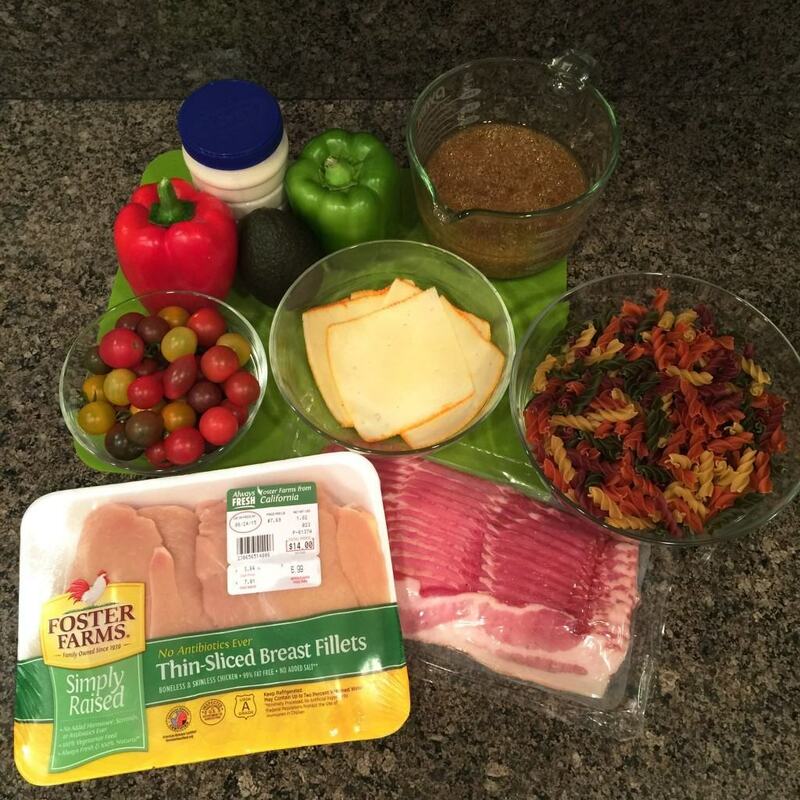 Foster Farms® chicken is truly healthy for my little family. According to a new independent survey of over 1,800 West Coast Millennial households (conducted by Metrix Lab and sponsored by Foster Farms), millennial parents are driving the demand for antibiotic-free and organic poultry and meat, citing “organic” or “no antibiotics” as the most important factors in choosing fresh chicken. I couldn’t agree more! 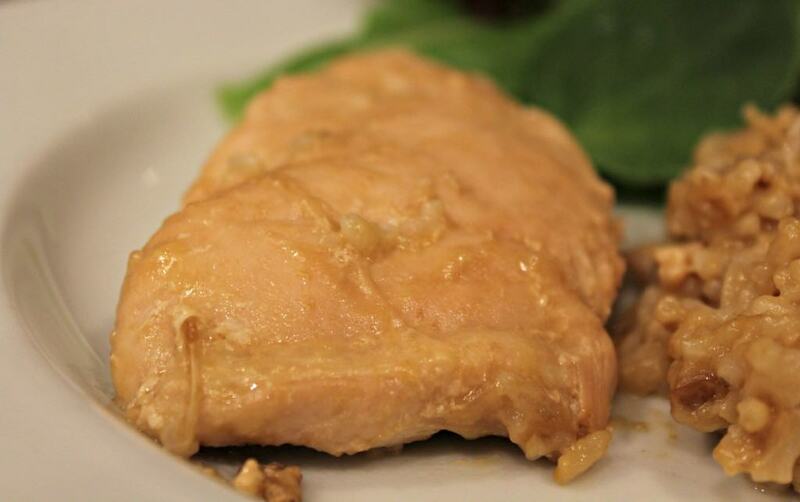 Layer the fresh Foster Farms® Simply Raised skinless chicken breasts in a crockpot and cook on high for approximately 4 hours. While the chicken is cooking boil the noodles. 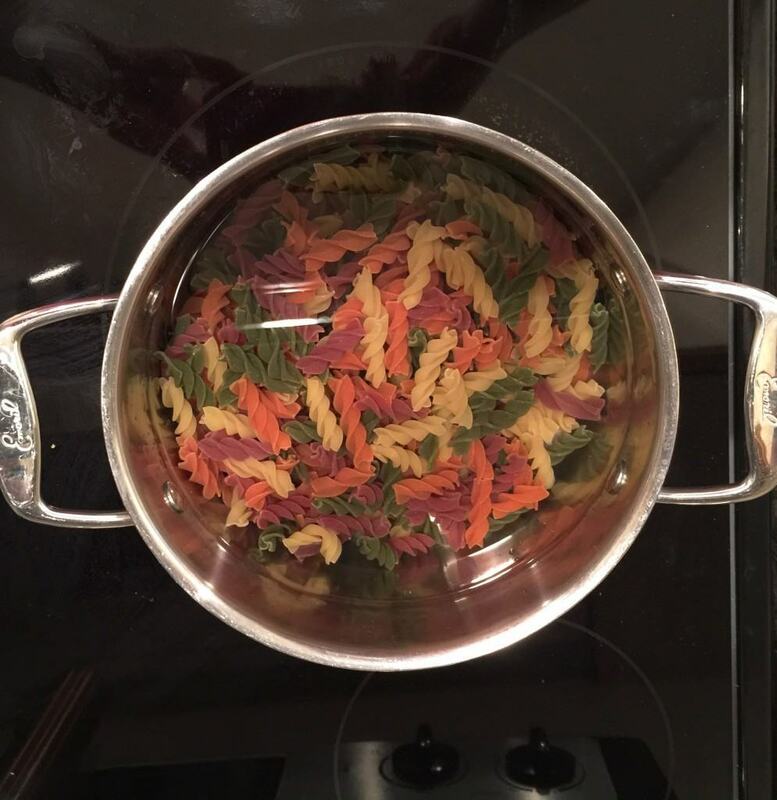 Once the noodles are done, drain them under cool water, and set them aside in the fridge until later. 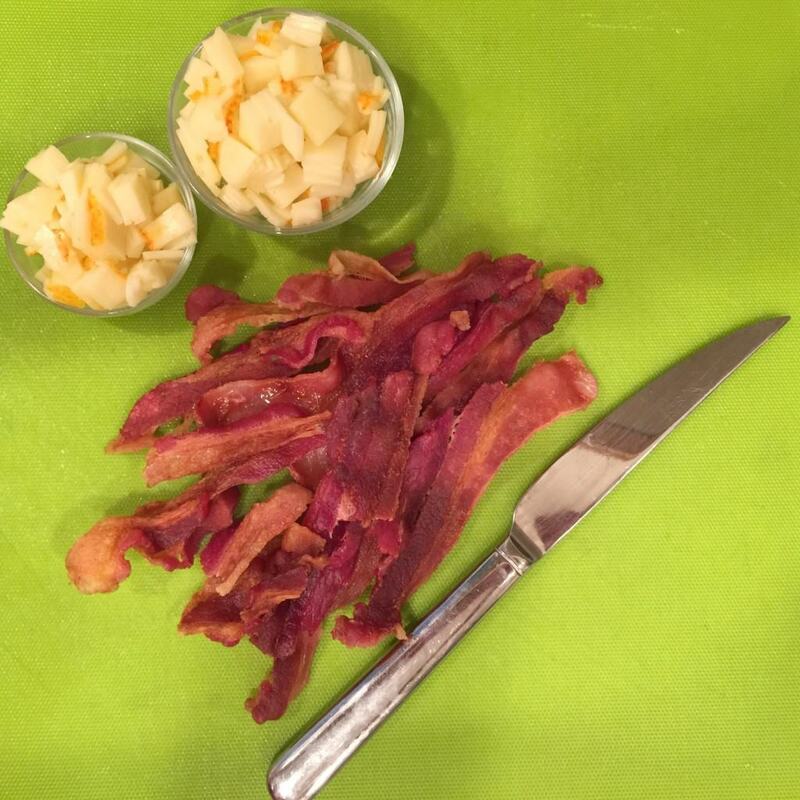 Next fry the bacon until crispy and cut into smaller pieces. 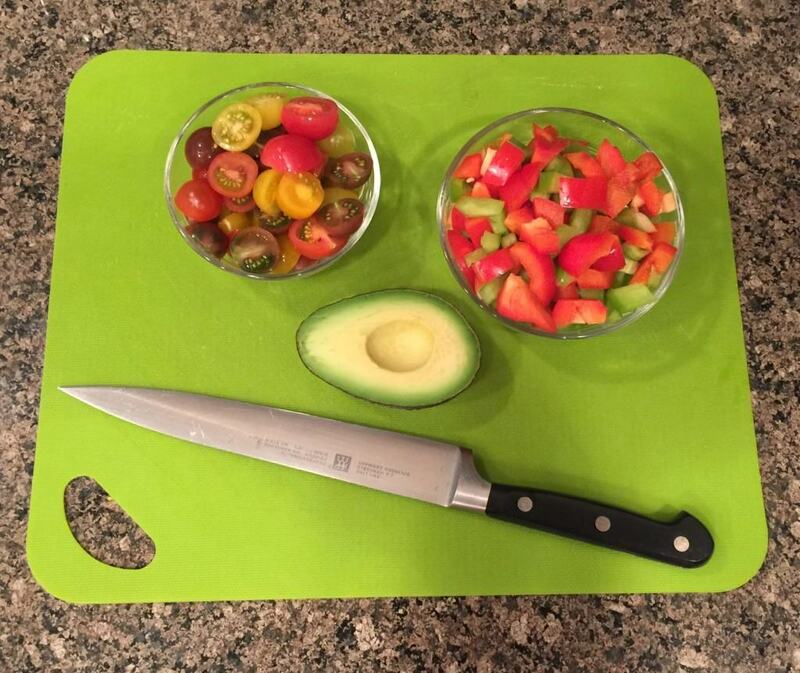 Cut up the green and red peppers, tomatoes, avocado and muenster cheese accordingly. Set aside in the fridge. 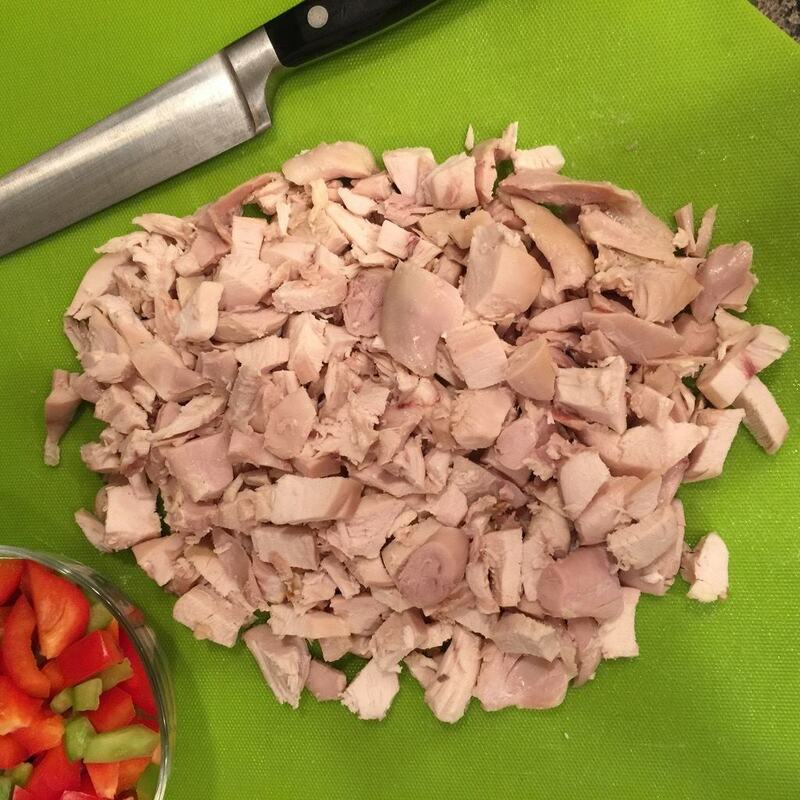 Once the chicken is done cooking, cut it into bite size pieces. 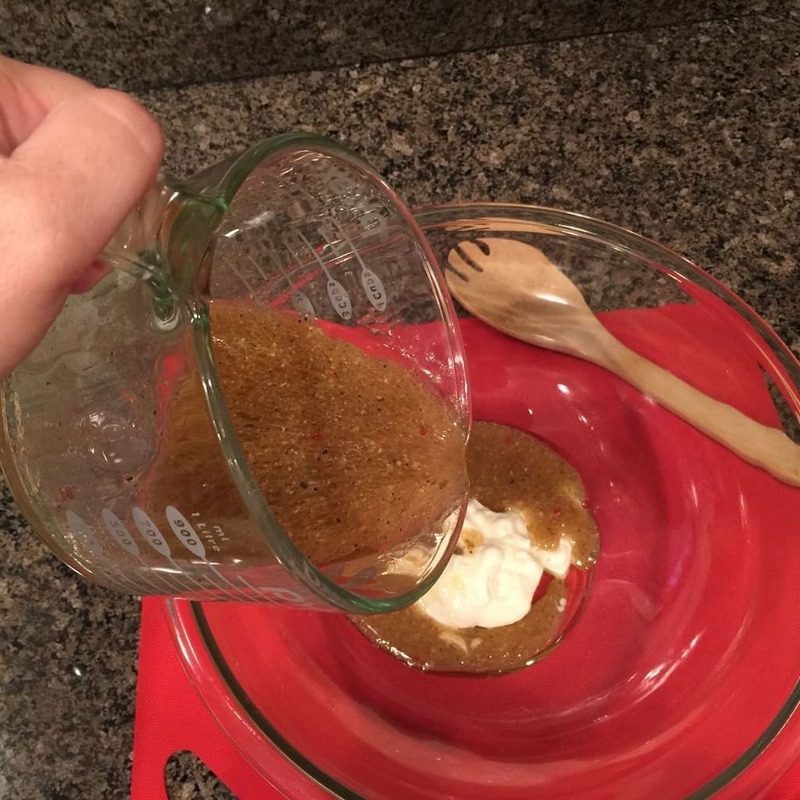 Next mix the ¾ cup Italian dressing in with the ¼ cup mayonnaise. 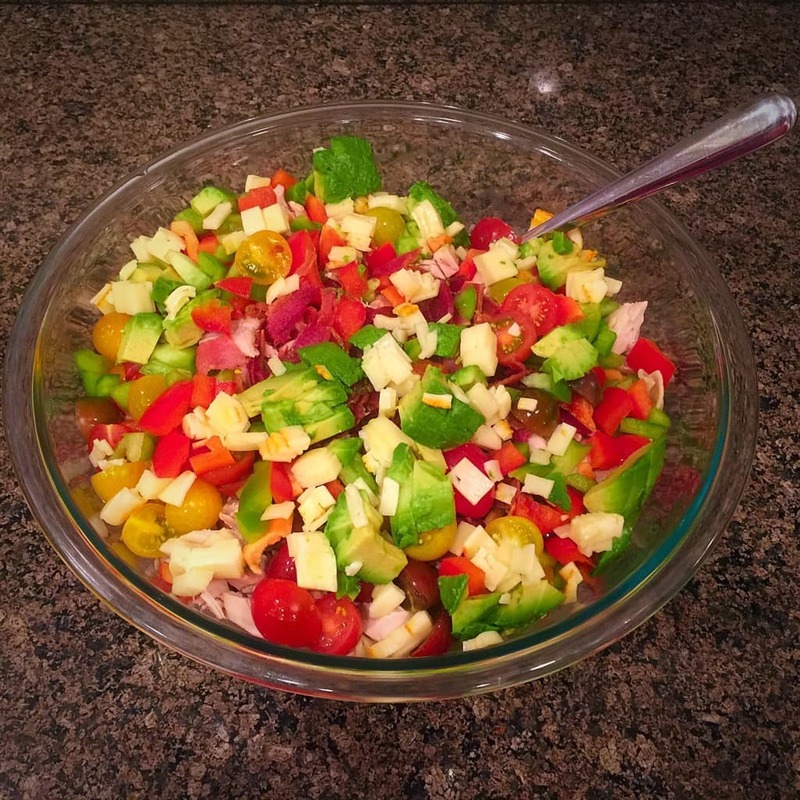 Finally, add in the chicken, bacon, green and red bell peppers, tomatoes, avocado and muenster cheese. 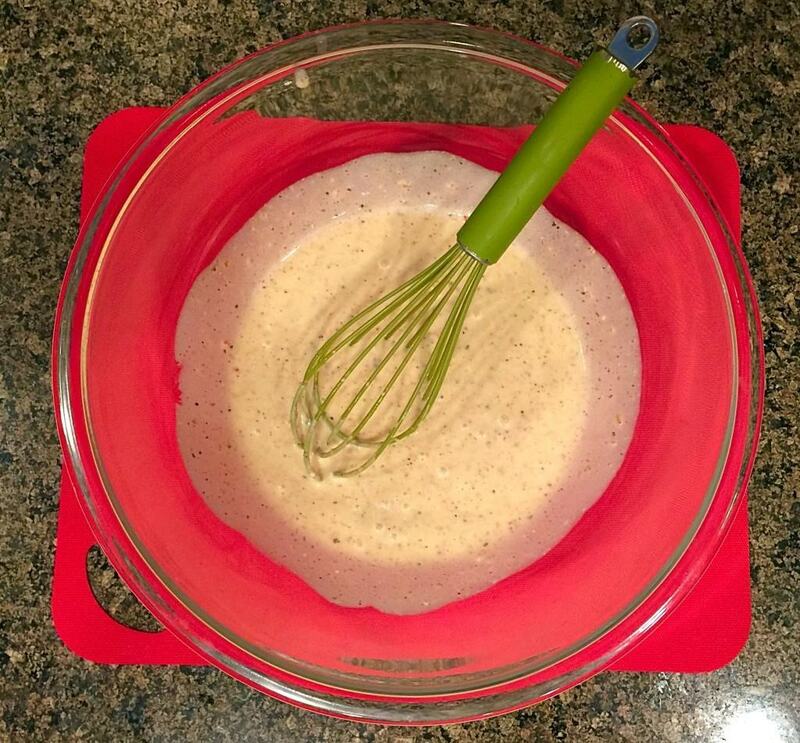 Mix all the ingredients together until thoroughly covered with dressing. Serve and enjoy! 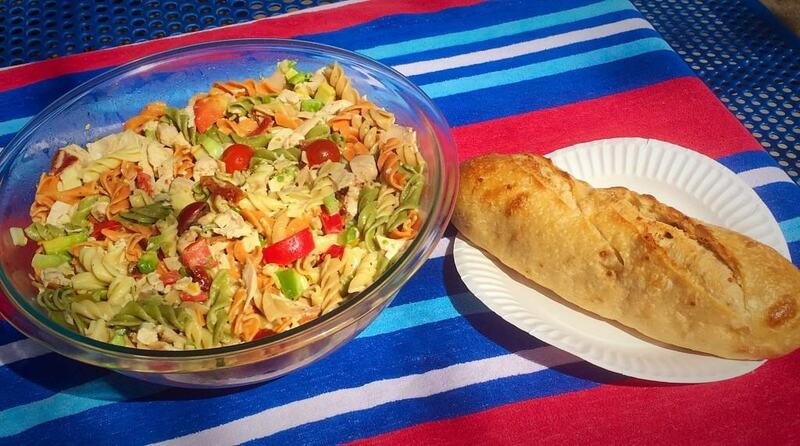 This salad also goes along nicely with crusted bread.